I decided to pay a visit to the lake to see if it would bring back childhood memories and also because I intend to hit as many campsites on Vancouver Island in the next few years to add value to this blog for everyone who has a dream to visit Vancouver Island to camp. We had just gone through one of the driest summers on record and all the watersheds on the island were in extreme mode so the previous 7 days of heavy rain was a welcome sight and my cue to put the camper on the pickup and head for Vernon Lake. Living in Gold River for the last 22 years puts me in a good spot to access most of the lakes on Northern Vancouver Island without having to burn too much fuel or travel to long a distance. The tranquility of Vernon Lake Recreation Campgrounds is only 1 hour and change away from my home so I loaded up all my supplies and hit the road. Use the form below to find out how to get to Vernon Lake using Google Maps. The road was in surprisingly good shape as I drove along the gravel route that winds between Gold River and Woss (hwy 19). There were a few pot holes and soft sections but nothing that a minivan, pickup/camper or SUV couldn’t handle. 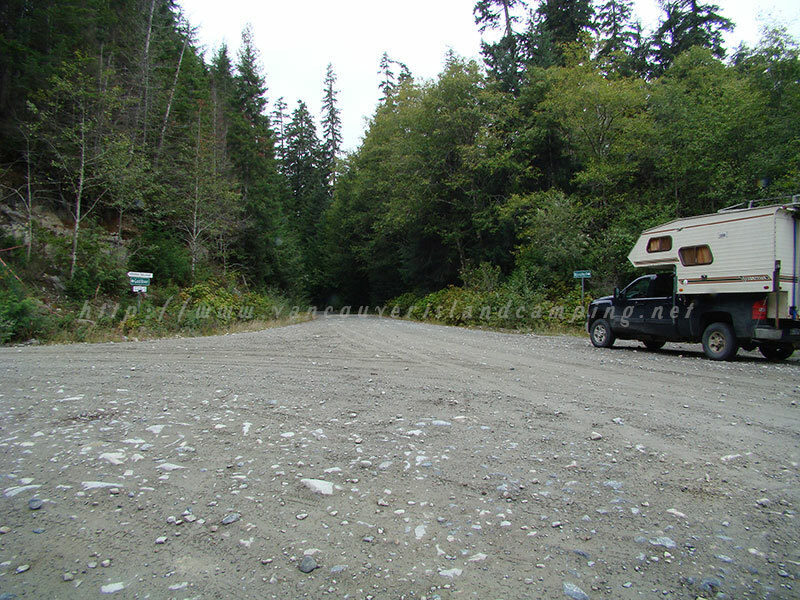 Even motorhomes would have little difficulty traversing the road however most will drive up to Sayward and cut across on the pavement then turn off at the Mt Cain road that leads south to Gold River. Stay to your right and cross over the Davie River bridge. From there it is only 20 km on Nimpkish Road to the Vernon Lake turn off and another 5 km to the campsite. 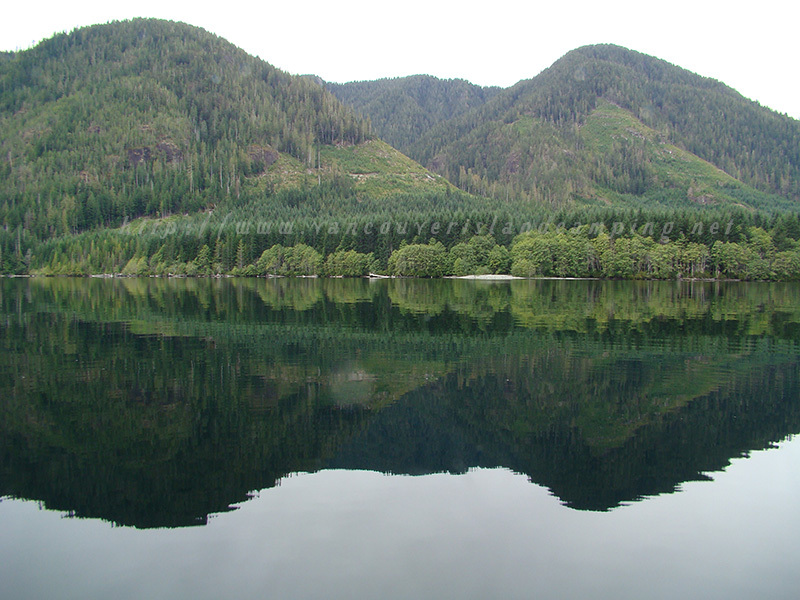 You’ll pass by the Klaklakama Lakes and another smaller lake on your right before coming to the Maquilla Reload area where you will cross two sets of railroad tracks and a bridge over the Nimpkish River to a junction where you turn right to Vernon Lake. Stay to your left until you arrive at the campgrounds. Of course I came in from the Gold River side so my journey was from a different direction. Coming from the Gold River end, once I arrived at the Vernon Logging Camp turnoff it was only another .5 km to the turnoff to the Vernon Lake Road. From there you travel another 3-5 km and then turn right at the Seabalhall Road intersection and go for another 5 – 10 km to the campground (look at the interactive map above to see where this road travels alongside the lake to the campgrounds). I drove around the campground until I found a site to my liking and pulled in to set up my site. There were a few other campers staying at the campground but there were still a lot of available spots to choose from. My site was right next to the pit toilets. Shortly after levelling my camper and getting my two Coleman chairs set up by the fire pit, the camp host came by and introduced himself as Ron. He was writing down my license plate and campsite number as was his job. I asked him how busy the campground was during the peak months of summer and if a camper could still find a spot during that time by just showing up. He replied that he always tries to find a spot for everyone who shows up even if it means they have to set up in an overflow area until a spot opens up. Campers are allowed to spend 14 days before they are asked to leave but there are always a few who only spend a few days or weekend before leaving so there is always a spot to move to at some point. Oh and did I mention there is no fee to camp here. Ron is on site from May to the Labor Day weekend in early September. I must say I was very impressed with his friendly attitude and the maintenance of the campground overall. It was very clean including the pit toilets which surprised me as most of the times they are not so clean at other campgrounds of similar quality. I didn’t check out the other pit toilets on site but based on my discussions with Ron I have to assume that they were in just as good a shape. I didn’t see any firewood boxes so I walked around and scrounged some firewood from empty campsites and there was more than enough for my two night stay. The fire pit is a large brake drum from a logging truck set upon a bed of rocks and held a good sized log easily. I spent the rest of the afternoon soaking up the sun in one of my chairs before walking around the rest of the campground to shoot a video for all of you to see. The people I met were very friendly and helpful with things like where the extra picnic tables were stored etc. The picnic table in my site was very old and well used but I decided to keep it anyway and just be careful what I set on it regarding weight. Still it sufficed perfectly to meet my needs for eating and sitting at. That evening I started a fire and sat around it looking at the night sky and watched the weather change before my eyes. I had already checked the weather before I left so I knew there was a change afoot. The sound of the night was very comforting and soothing with the distant water running down the creeks and the wind blowing through the trees and valleys. Other than that the odd bird would sing and a couple of squirrels were fighting over a place in the trees above me. I even saw a few bats overhead swooping up insects that I knew were around but because of the constant breeze never bothered me once. The next morning I put on my waders and donned my float tube. I headed across to the other side of the lake where some of the campers had informed me of their success in catching trout. The sky was overcast but not raining yet so I didn’t have too much trouble kicking my way across. Once there I tossed out my fly and working it for a few casts I hooked into my first trout. Nothing special, roughly 12 inches so I released it and changed my fly. Vernon Lake is a very deep lake so trolling with a boat would probably yeild better results as you can vary your depths targeting the thermoclines where the fish will likely be holding. I caught three more about the same size or a couple inches larger before looking into the sky and noticing the color changing to a little darker shade than when I started. I decided to start making my way back to the campsite. Once back at camp and all my fishing gear put away the wind picked up substantially and it didn’t take long for the rain to fall. I bet the wind was about 20-30 km per hour, but only lasted for about an hour before the rain took over. The rain fell throughout the day off and on but never consistent for any length of time. I enjoyed the feeling of the cleanse Mother Nature was providing knowing full well that it was a much needed wash. 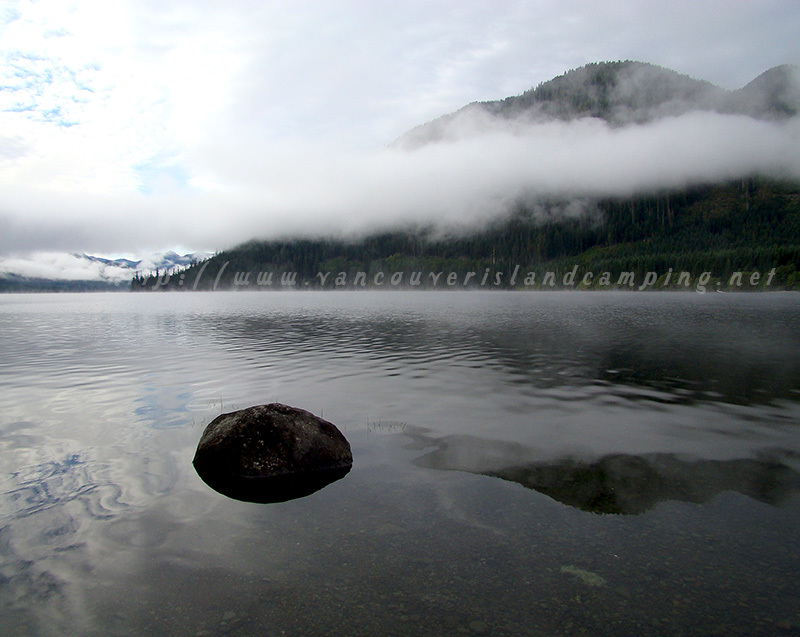 Overall I would have to say that Vernon Lake Campsite is an excellent place to visit and ranks high on my preference of places on northern Vancouver Island to visit and return to for sure. I imagine that like every other popular spot it will be crowded during the summer months but I will definitely come back in the months of May, June and September to avoid the rush. It is a very well maintained campsite with roughly 30 spots including the overflow areas. The majority of the campsites are on the water side with about 1/3 on the forest side of the road. There are a few places where you can launch a boat, some of them inside the actual campsite but I bet if you were to ask nicely other campers would have no problems allowing you to launch your boat where you could then motor it over to your site and tie it up on the beach out front. If you’ve ever wondered about Vernon Lake Recreation Campgrounds and thought about visiting it, I can guarantee you a wonderful experience in comfort with the only caveat being the crowds during the summer months. I was told that also during the rainy season some of the campsites get flooded as the lake rises but you just have to move the fire pit to higher ground. There are a few sites on higher ground to choose from also. Give it a try I believe you will enjoy yourself. This lake brings back some great memories of when I used to take my family there to camp while I was working for Canfor at Vernon Camp just down the road. Made life a little easier when I got to travel about 20 minutes to be with my wife and kids instead of always having to drive to Courtenay where we lived at the time. Some great fishing on this lake too I remember. Thanks for the memories much appreciated. Thanks for your comment Harold. The fishing is still good with some nice sized trout caught regularly throughout the summer. Great story about your family and work camping experiences, not sure if you are aware but the camp belongs to Western Forest Products now. I worked in vernon from ’74-’83 and summers at the lake were the highlight. I think Lanceys availed us of foodstuffs,pop and icecream. It was like a small village of happy people! Thankyou for reminding me. Lotsa fish too! Bob, you’re very welcome! Thanks for leaving us a comment about your experience with Vernon Lake and the camp. Hopefully you’ve shared us on Facebook and Twitter. wink wink. Looks amazing, cannot wait to start exploring these awesome spots. Thanks for the awesome website. Wendy, you’re very welcome and thanks for the kind words. Make sure you check back and leave some feedback on places you visit. Also don’t forget to like and share us on facebook or tweet us to your friends. Hi Leslie, thanks for your comments. 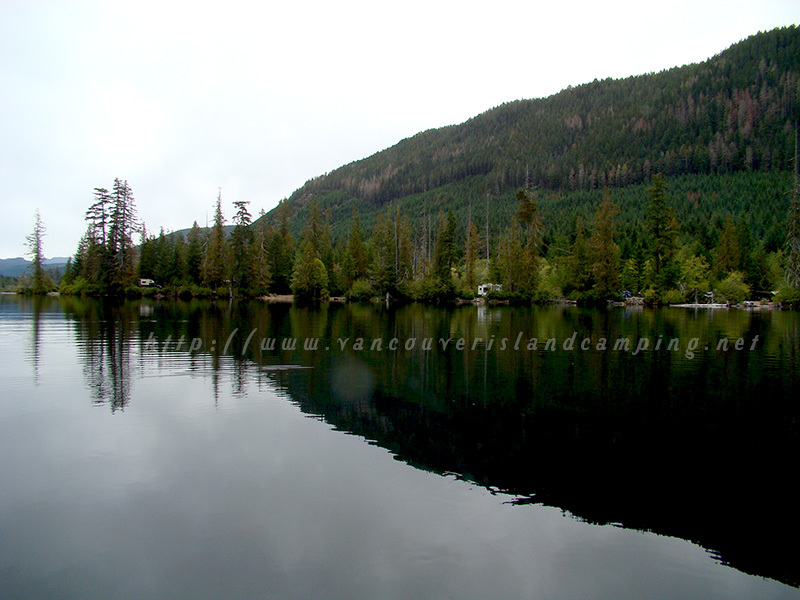 Hope your next visit to Vernon Lake campgrounds is an enjoyable and memorable one!